Splash Cincinnati is the area’s only 55,000-square-foot indoor aqua adventure! The indoor waterpark boasts family friendly pools, raft and body slides (some up to four stories high! ), an expansive video game arcade, relaxed bar, adult only spa, and much more. Yes, the palm trees are real! Splash Cincinnati also has party rooms for celebrating kids' birthday parties. Splash Cincinnati is a great indoor activity open year around with lots of attractions for the whole family. We have highly trained lifeguards onsite to ensure everyone is having fun—safely. It is always warm and sunny at Splash Cincinnati! Experience a Wet `n Wild Family Fun and Entertainment time with us at Splash. Feel like a kid again, as we have rides for each and every one of you and your family to enjoy. 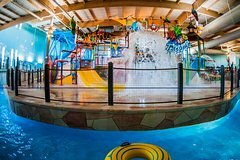 A day in the waves at Splash Cincinnati generates quite the appetite, so fortunately we have lots of scrumptious eating alternatives situated inside the water park to fulfill your cravings. Sunset Bar is fully stocked with snacks and drinks for both adults and kids. Grab a light snack from choices like warm nachos, soft pretzels and mozzarella sticks. You'll also experience arcade games like never before at Splash. Arcade games are best stress busters, and we assure the kind of amusement that you get from our arcade recreations is a perfect place for you and your kids!